Download this freebie Firetruck Game to encourage fine motor and visual motor skills. It is available in color and black and white. Give each player a board. Roll one die. 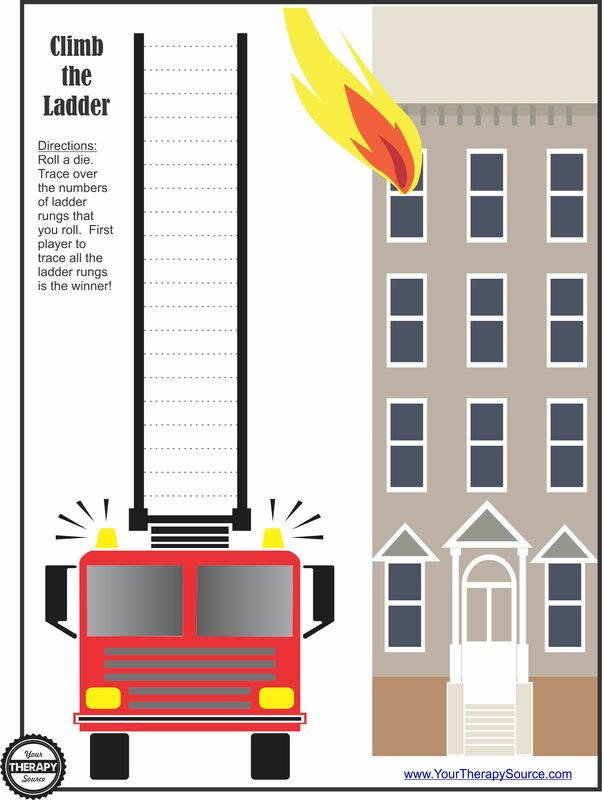 Trace over the number of ladder rungs that you roll. The first player to trace all the ladder rungs is the winner! Download the Firetruck Game here. Watch a turn in action. Need more visual motor ideas? 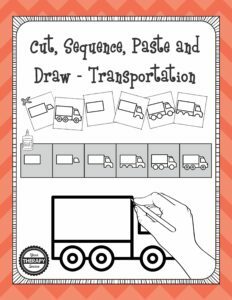 Check out Cut, Sequence, Paste and Draw Transportation to practice: scissor skills, fine motor skills, motor planning and visual motor skills. Download a free truck page. 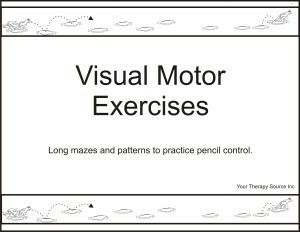 Visual Motor Exercises includes 25 long mazes and patterns to print, assemble and complete to practice pencil control. Once the pattern/maze is assembled it is 28 inches in length. This length encourages the child to cross midline and to rotate the head (vestibular input) while completing the visual motor exercise. The patterns and mazes vary in difficulty from easy to hard with horizontal, vertical, diagonal, curves and circular patterns. The patterns/mazes are all in black and white. There is a step by step direction sheet with color photos for the children to follow along. FIND OUT MORE INFORMATION here and download a freebie page.